See story and pictures of July 2nd Human Chain Against the Chained CPI, by Patricia Jackson. Click here. View some of our past programs. NEW: SF Gray Panthers opposes Sen Weiner's amd Mayor Breed's dangerous plan to take away homeless people's legal rights through a new form of conservatorship. Here's why. | Help us gather information. NEW: SF Gray Panthers endorses Evolve's 2020 ballot proposition to reform Prop 13, assessing commercial and industrial properties at market value for property taxes (except for small businesses), while maintaining Prop 13 property tax protections for all forms of residential property. Eliminating the current corporate loophole on re-assessments would give local governments and schools $10 Billion more per year. Read more. 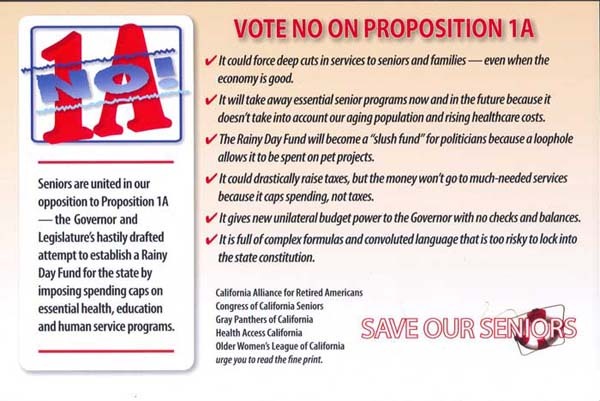 NEW: SF Gray Panthers is a member of CARA, the California Alliance for Retired Americans. Read CARA's recommendations on State ballot measures in the November, 2018 election, especially YES on 1, 2, 8, and 10; and NO on 5, 6, and 11. 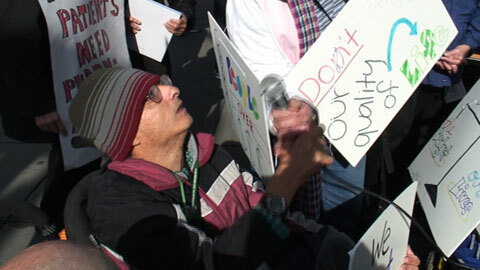 Read SF Independent Living Resource Center's Jessie Lorenz SF Examiner great article on why single-payer universal healthcare and universal long-term support and services are necessary for people with disabilities and seniors. Watch the Gray Panther-initiated November 19 2016 Post-Election Political Roundtable - "this exceptional public forum featured guest speakers Laurence Shoup, Peter Dale Scott, Stephen Zunes, David Talbot, Peter Phillips, with additional comments by Lotus Fong & Ron Dicks, and pertinent audience questions." Also read the Coalition's longer and more detailed report Build Justice, Not Jails. Vial of Life and Healthy Aging Project: Find Out More || Download Vial of Life Form . Read the California Domestic Workers Coalition 4-Part Dignity in the Home Platform, expanding support for those needing in-home assistance, and supporting the domestic workers who provide that assistance. Read about the "Support at Home" Program, a proposal for San Francisco to help pay for home care for seniors and people with disabilities who are too poor to pay out-of-pocket but not poor enough for for free home care. Read letter of May Day coalition to Alameda County Sheriff Ahern demanding end of cooperation with ICE, stop covering up police violence, stop contracting jail medical care to a dangerous private company, and stop militariazing police. No Tasers for SF Police! Tasers will not reduce officer-related shootings! Jailing killer cops would be a start. Why we love the Coalition on Homelessness: Read their 2015 report. CARA Convention Resolutions on Long-Term Care as part of Single-Payer, and Racism, Mass-Incarceration, Police Shootings and Prison Construction. Support Prop I, Moratorium on Luxury Housing in the Mission. Read the Fact Sheet. Why do we need Eviction Protection 2.0 to be passed by the SF Board of Supervisors? Read a summary of the proposed ordinance. New Medicare Fact Sheet: History of Medicare, How Medicare helped desegregate US hospitals, Medicare Today, Why we need Medicare for All, and How Ryan budget will kill Medicare. Nurses Speak on Medicare-For-All! A great Medicare Birthday leaflet showing why we need universal, cradle-to-grave, improved Medicare (single-payer). Not just the usual arguments! NO NEW SF JAIL AND MORE POLICE! Critical Resistance has issued a new People's Report on how a new SF Jail and hundreds more police would lead to increased criminalization of homelessness and poverty, how much the Jail would cost and how many services would be sacrificed to pay for it, why the Jail is unnecessary, what are the alternatives to building a new Jail, and how to get involved and join the fight against a new SF Jail. Read the report here, and come to the Supervisors' Hearing, Thursday, June 18, 2 PM, convened by Sup. Jane Kim, on alternatives to a new SF Jail. Real Regulation for AirBnB and the Other Short-Term Rental Platforms That Are Turning Our Rental Housing into Hotel Rooms! Read a Q&A explaining the Sharebetter Ballot Campaign to force big-business to follow City law, while sparing those renting out extra rooms. Short summary of the measure and who's behind it. BART: Drop the Charges And the Fines Against the Black Lives Matter 14! 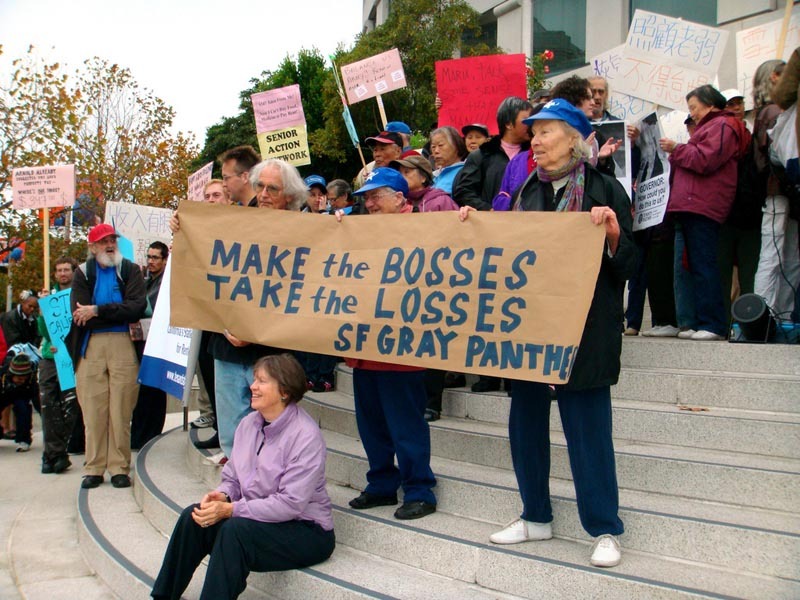 Gray Panthers letter of support for SF MUNI drivers. It is OUR City College! The Accreditation Agency's latest offer is a dangerous trap. Why we need to update and improve SF's Health Care Security Ordinance, provide care for all San Franciscans, and close the loophole for SF business employing low-wage labor. CPMC cuts services to Spanish-speaking St. Luke's Hospital patients, announces intention to serve the neighborhood that is "better employed and better educated." CARA letter to Sacramento on State Budget: Using surplus to restore Safety-Net programs Is more important than creating a Rainy Day Fund or paying down the debt! Police Violence Against City College Students. Get the Facts. Keep City College Open. Scrap the Cap, Give us real COLAs! Are You Living in Public Housing or an SRO and having elevator problems? Take SDA's Elevator Survey: Let the City know they need fixing! A Gray Panther writes SF Supervisors: No New Jail! Sign Petition demanding pardon or clemancy for Snowdon. Watch "Unmanned: America's Drone Wars"
What is Jobs With Justice-SF? Should We Criticize BART Workers, Or Join Them? What's Next for Medicare-For-All / Single-Payer Healthcare in California, from the Campaign for a Healthy California. How Does Obamacare Compare with Medicare-For-All in Calif? On Just Medicare? NOTHING CHANGES! Stay off the Exchange! SF Gray Panthers say No Exceptions to Due Process Ordinance! Tuesday, July 2nd: Human Chains Against the Chained-CPI. 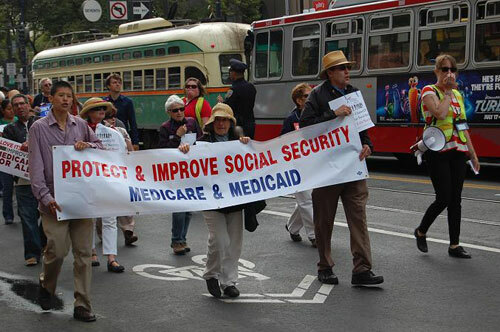 Join us in San Francisco as part of the national action to protect and improve Social Security, Medicare and Medicaid. SF Says NO! to the Indefinite Detention provisions of the National Defense Authorization Act (NDAA). See City Hall Rally before introduction of a Supervisors' Resolution opposing it. CPMC/Sutter: San Francisco Needs Healthcare, Housing, Jobs, And Justice! Read the Community's letter to the SF Supervisors. Pelican Bay Prisoners fighting tortuous conditions initiate agreement to end hostilities between racial groups in California facilities. Save the People's Post Office! Great Leaflet. Latest News. SF Gray Panthers and Senior & Disability Action close Wells Fargo accounts and hold demonstration in protest of WFB's forclosures and evictions. WFB has 40% of US home mortages and and has has over twice as many auctions of foreclosed homes in SF as other banks combined! Demostration against Post Office Closings and Sell-Offs by zillionaire Richard Blum, real estate magnate and UC Regent. Sign on-line petition: women, communities of color, and allies call for (1) No Cuts to Social Security, Medicare, and Medicaid benefits, (2) Let Bush tax cuts expire for wealthiest 2%. Gray Panthers Presents "What is the Universal Declaration of Human Rights?" Saturday, August 4th & Saturday, August 18th. Alan Simpson goes ballistic over CARA's opposition to the Cat Food Commission's plans! Here's the leaflet that drove him crazy. Payroll Tax Cut? Payday Loan is more like it! Bill Clinton's savage program of Welfare Reform, effects on women and children. What's wrong with Ryan and Wyden's plans to turn Medicare over to HMOs and issue vouchers that won't cover the HMOs' charges. March 2012, Oakland, We gave Simpson & Bowles the greeting they deserved! How Propositions C and D attack health and pensions of SF's low-paid City Workers. Demonstration at Obama Campaign Headquarters: HANDS OFF SOCIAL SECURITY, MEDICARE, AND MEDICAID! Gray Panthers were born fighting racism and war at the 1971 White House Conference on Aging, which ignored problems of black seniors. Social Security is NOT Broken! Don't Let the Bosses Kill It. No Tasers for SF Police! Monterey, Calif., Feb. 21: Bowles! Simpson! Stop using the deficit as a phony excuse to gut our Social Security, Medicare, and Medicaid! Simpson and Bowles! We've got some questions for you! Deficit Commissioners Alan Simpson and Erskine Bowles devastating plans for Social Security, Medicare, Medicaid, and Jobs. Ashley Carson, Older Women's League Executive Director, tells Obama's Deficit Commission about the importance of Social Security, especially to women. SF Gray Panthers support MUNI drivers resisting concessions that would lead to more service cuts. What's wrong with MUNI's "saturation" raids on bus passengers? No MUNI service cuts! No MUNI fare increases! Make downtown business pay for what MUNI gives them. Watch Senate testimony by Single Payer advocate Marcia Angell M.D., that targets profits of entire health industry, not just insurance companies. Watch Bill Moyers interview with Single Payer advocate Marcia Angell M.D., on what's wrong with Obama's health plan. Solidarity with Students: Demonstrate against dismantling of public education. 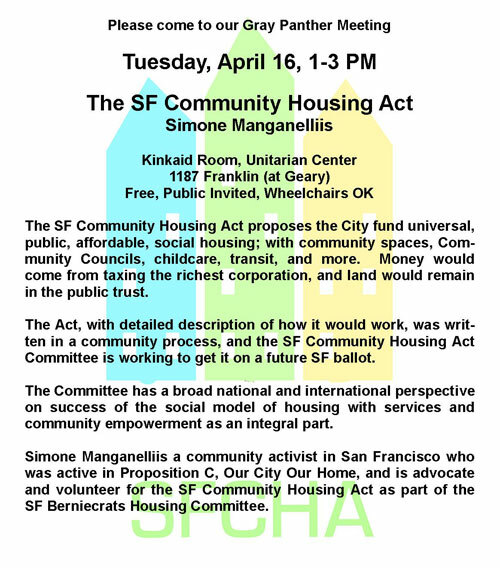 Thurs, March 4, 5 PM, SF's Civic Center. Read leaflet relating these cuts to Social Security, Medicare, and Medicaid cuts. FLASH! Obama proproses his own Commission to make fast-track cuts to Social Security, Medicare, and Medicaid. ALERT! Tuesday, January 19, National Call-In Day against forming a Task Force to cut Social Security and Medicare. Gray Panthers writes Obama criticizing his paying $780,000 to economist Jonathan Gruber to write articles supporting Obama's private-insurance-based health plan. Gray Panthers and CARA demand IHSS be preserved. Iraq Vet: Our real enemies are not ones living in a distant land, they are here in front of us. Racism is their weapon. under attack by station management. Please help. "Here is On Lache Rien ! (We Don't Give Up! ), a great French revolt song by the French band HK et Les Saltimbanks. As one of the Saltimbanks' lines goes: "The alarm clock has gone off/It's time to reset the counters to zero!" Fighting City and State Budget Cuts: Make the Bosses Take the Losses! 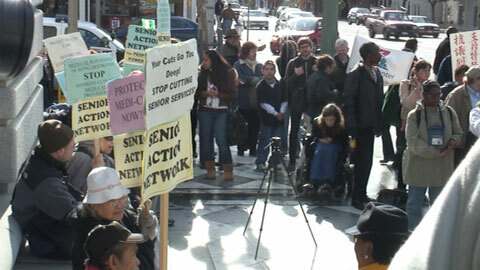 SF Gray Panthers at the November 19, 2008 demonstration against Schwarzenegger's elimination of the Renter's Rebate. The largest of Schwarzenegger's personal line-item vetoes after the budget had been settled with the legislature, this program had existed for decades to give hundreds of thousands of California's poorest seniors and disabled people a few hundred dollars per year to help buy food, medicine, or maybe even a Christmas present for their children. SSI and SSDI recipients have already lost a $200 cost of living adjustment. Medicare-MediCal recipients have lost $96 in assistance for Medicare Part B premiums. Read more from BeyondChron. More from Senior Action Network. See videos of this demonstration. See earlier demonstration against state cuts. San Francisco, Feb. 18, 2009. Over 200 people protested California’s renewed attempt to make a 10% cut in payments to doctors, pharmacies, clinics, dentists, and adult day health centers that provide care for Medi-Cal patients. Dozens of patients, many in wheelchairs, gave moving testimony that the cuts would either kill them or destroy their quality of life. Read more. Lifetime Attorney-Activist Lynne Stewart is back in jail. Medicare is endangered by healthcare "reform" that's based on private insurance. Single Payer Now! Why Afghanistan? It's pipelines, not terrorism. Should we endorse a National Health Service? These Medi-Cal Benefits are NOT Optional! Victory for SF8! DA admits it: Insufficient Evidence! Conditions in Gavin Newsom's Homeless Shelters. 10% salary cut could free up millions for needed services. New GP Leaflet: Health Care and Human Services are Human Rights. We Need a Fair San Francisco Budget! Stopping these corporate tax giveaways could restore the State's health, education, welfare, and park cuts. Cost containment has replaced concern for the uninsured in driving healthcare restructuring. What does this imply? San Francisco's corporate and individual wealth is enough to pay for the vital services the City wants to cut. Where should they cut the San Francisco budget? SF Rally: Nancy Pelosi, Put Single Payer on the table! On Dr. Tiller's murder, a Gray Panther recalls her experience defending a clinic. Stop CPMC's plans to strangle St. Luke's Hospital, gentrify it medical facilities, and abandon skilled nursing care. Support Gray Panther friend Dee Allen, arrested for protesting the racist and xenophobic Minutemen. FLASH! Students shut down ICE operations in San Francisco, police shut down BART stations to try to prevent action. Human Rights, the Patriot Act, Media Reform, Single Payer Healthcare, Medicare Modernization Act, Immigration, and Mumia. June 19: Healthcare YES! Insurance Companies No! Protest at national health insurance convention in San Francisco. Save Rent Control in California: NO on Prop 98, YES on Prop 99! Taxes: We Can't Afford the Rich! Say NO! to the "Violent Radicalization and Homegrown Terrorism Prevention Act of 2007"
Youth need jobs, education, housing, medical care and recreation! NOT GANG INJUNCTIONS! Support the SF8, on trial based on police torture. No Justice, No Peace! US Out of the Middle-East! August 8th Demo: Healthcare YES! Insurance Companies NO! The 2003 Medicare Modernization Act Threatens Medicare Recipients and Medicare itself. A Progressive Platform for the US, we want a NEW New Deal! How Can We Survive Medicare Drug "Benefits"? Feb 14, 2007 demo, Feinstein, Don't Cut the Heart out of Social Security.